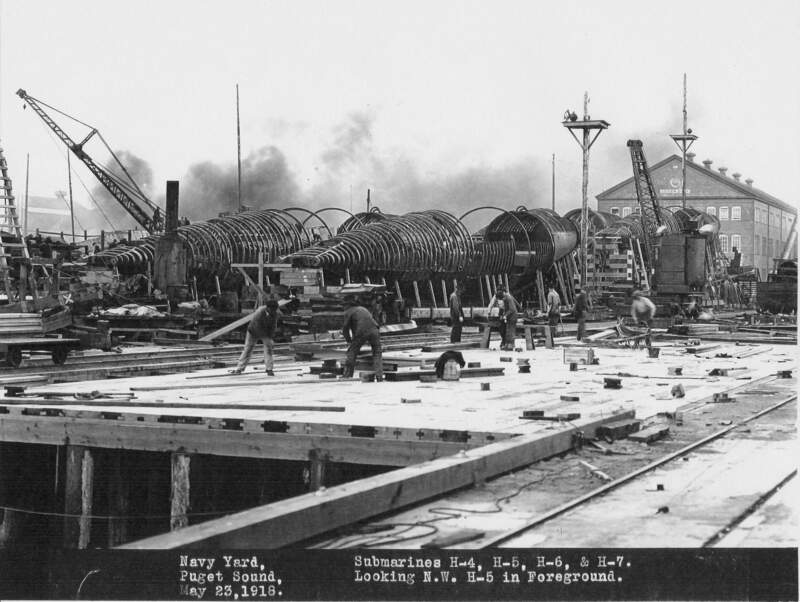 O Class Submarine: Laid down, 27 July 1917, at Puget Sound Navy Yard, Bremerton, WA. 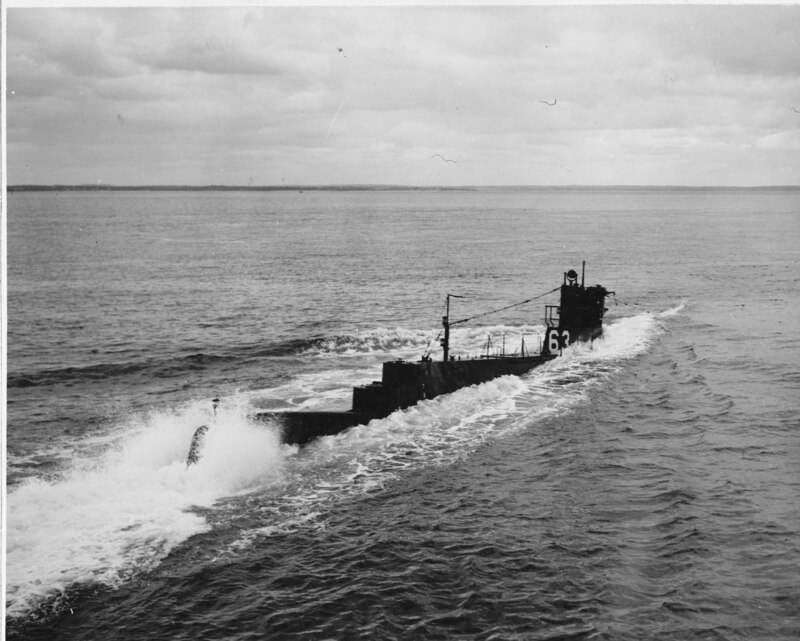 ; Launched, 24 May 1918; Commissioned, USS O-2, 19 October 1918; Designated (SS-63), 17 July 1920; Reclassified a 2nd line submarine 25 July 1924 and to a 1st line submarine, 6 June 1928; Decommissioned, 25 July 1931, at Philadelphia Navy Yard, Philadelphia, PA.; Laid up in the Atlantic Reserve Fleet; Recommissioned, 3 February 1941, at Philadelphia; Decommissioned, 26 July 1945; Struck from the Naval Register, 13 August 1945; Final Disposition, sold for scrapping, 16 November 1945. Specifications: Displacement, Surfaced: 521 t., Submerged: 629 t.; Length 172' 4"; Beam 18' 0"; Draft 14' 5"; Speed, Surfaced 14 kts, Submerged 10.5 kts; Operational Depth Limit 200 ft; Complement 2 Officers 27 Enlisted; Armament, four 18", torpedo tubes, 8 torpedoes, one 3"/23 deck gun; Propulsion, diesel-electric, New England Ship and Engine Co, diesels, 880 hp, Fuel Capacity, 21,897 gal. ; New York Navy Yard electric motors, 740 hp, Battery Cells 120, single propeller. 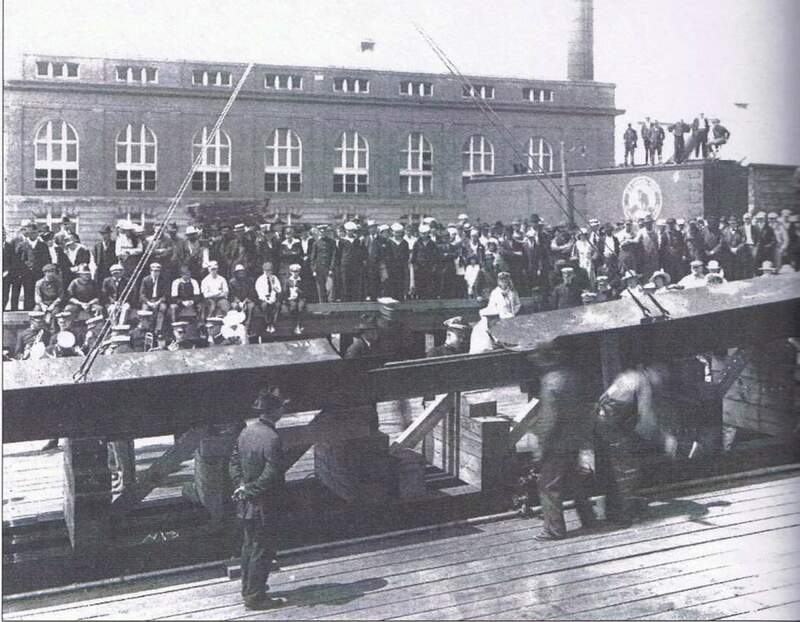 127k The O-2's (SS-63) keel laying on 27 July 1917 draws a large crowd to the Bremerton Navy Yard, including the Navy band, left foreground behind the keel plating. USN photo & text courtesy of Beneath the Surface: World War I Submarines Built in Seattle and Vancouver by Bill Lightfoot. Photo courtesy of Larry (Jake) Jacobsen. 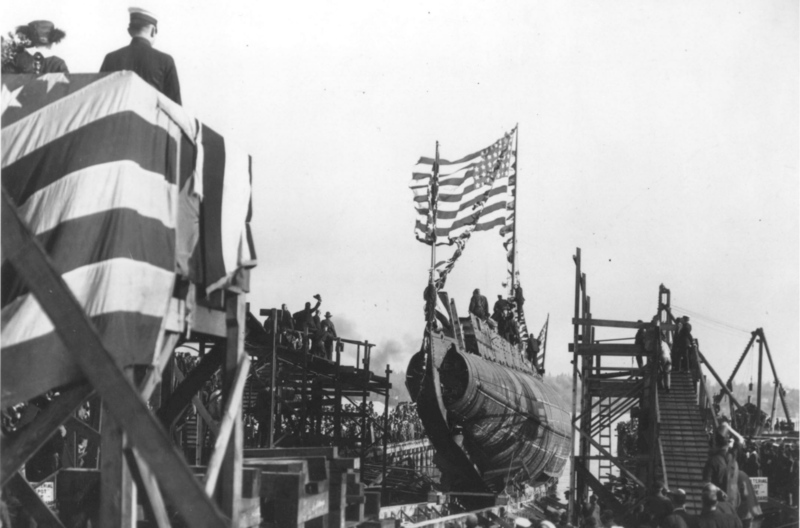 380k O-2 (SS-63) slides down the launching ways at Puget Sound Navy Yard, Bremerton, WA., 24 May 1918. USN photo courtesy of ussubvetsofworldwarii.org. 673k H-boats in frame at Bremerton Naval Shipyard, approximately 18 July 1918. From the back right; H-4 (SS-147). In front is the H-5 (SS-148). To the left of the H-4 is the H-7 (SS-150). To the left of the H-5 is the H-6 (SS-149). H-8 (SS-151) and H-9 (SS-152) are not seen. Under the boom of the crane is the just about finished O-2 (SS-63), soon to be launched. This is from a negative from the personal collection of Ric Hedman and acquired through Bill Lightfoot's research library, which he gave to me; he is the author of Beneath the Surface: World War I Submarines Built in Seattle and Vancouver. 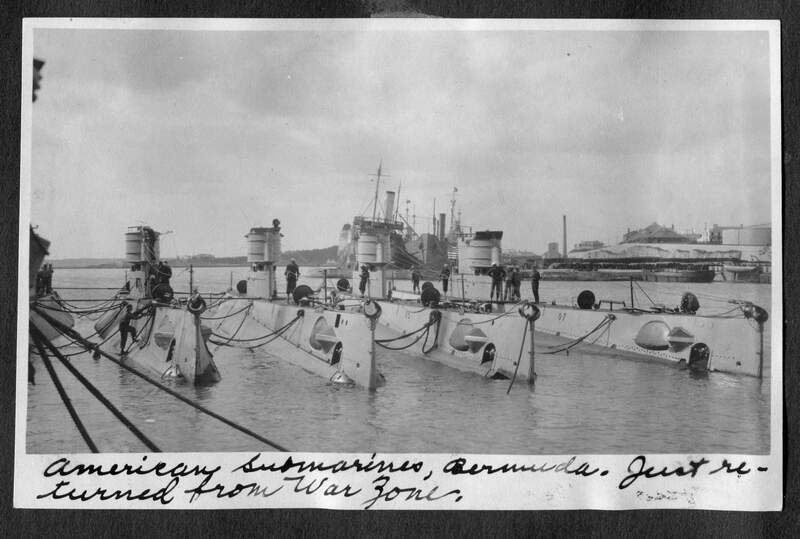 579k U.S. submarines at Bermuda. Just returned from war zone. From left to right, 2 unidentified O-boats, O-3 (SS-64), O-5 (SS-66) & O-7 (SS-68). 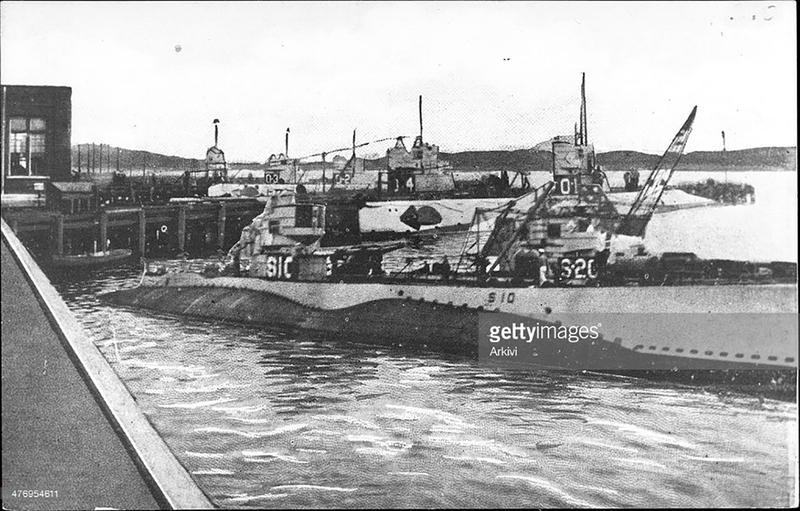 On 2 November 1918 O-boats 1 / 10 (SS-62 / 71) departed Newport with a 20-sub contingent bound for European waters, however, the Armistice was signed before the ships reached the Azores, and they returned to the United States. Text i.d. courtesy of DANFS. Photo by James W. Anderson, courtesy of Kristina Magill via Gary Priolo. 1.04k Late type American submarine, Bermuda. One of the unknown 10 O-boats 1 / 10 (SS-62 / 71) . Photo by James W. Anderson, courtesy of Kristina Magill via Gary Priolo. 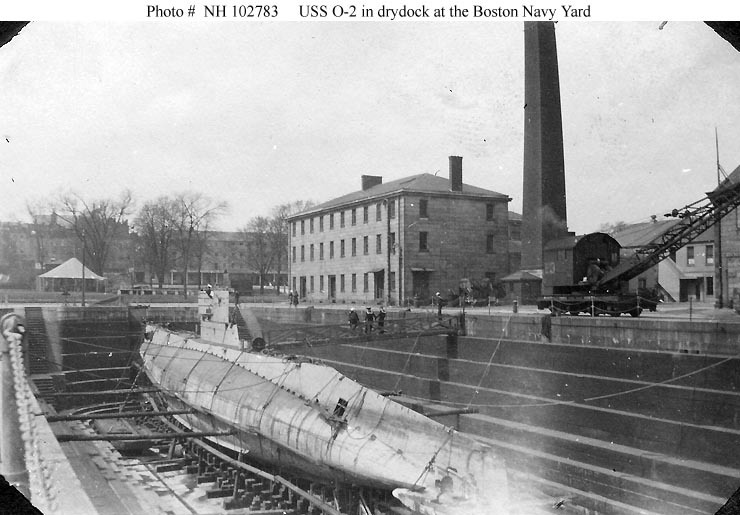 77k O-2 (SS-63) in drydock at the Boston Navy Yard, Charlestown, Massachusetts, circa 1919. USN photo # NH 102783, courtesy of USNHC. Collection of Christopher H.W. Lloyd. Donated by Virginia Agostini, 1990. 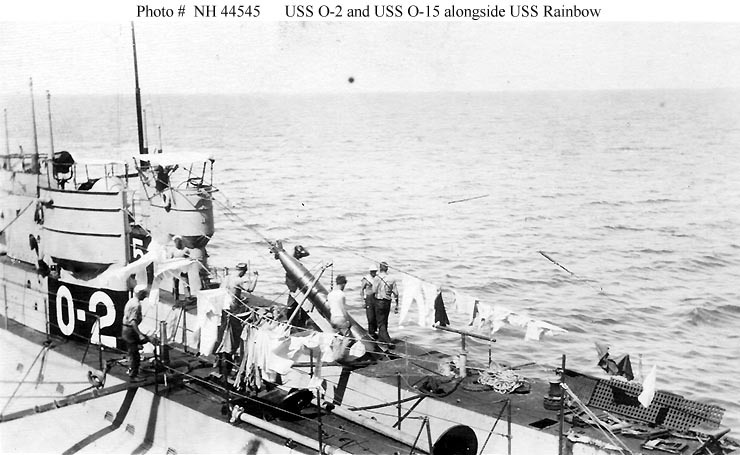 79k O-2 (SS-63) & O-15 (SS-76), alongside Rainbow (AS-7), circa 1919. An 18-inch torpedo is being lowered down O-15's forward hatch. 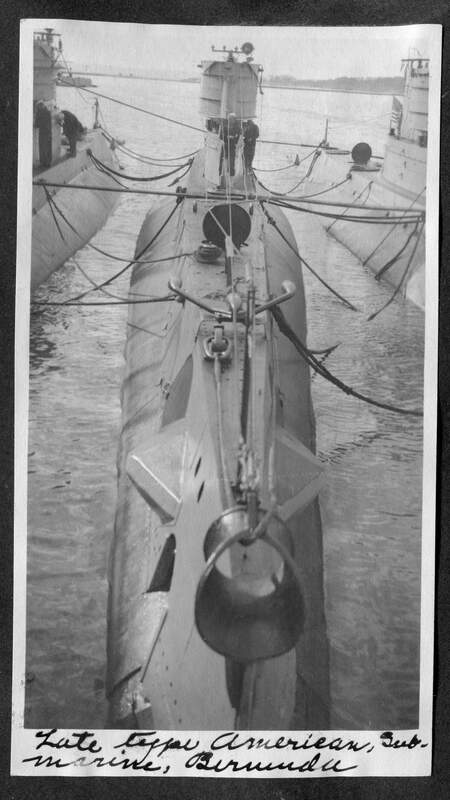 Note the retracted 3"/23 gun just forward of O-2's fairwater, and the "SC-Tube" hydrophone on O-15's foredeck. USN photo # NH 44545, courtesy of USNHC. The Saxonia, (now Savannah (AS-8)) once considered the finest German passenger ship, is now a mother for United States submarines. Here she is off the coast at Provincetown, Mass., with some of her cubs. Image and text provided by Arizona State Library, Archives and Public Records; Phoenix, AZ. Photo from the Bisbee Daily Review. (Bisbee, Ariz.) 1901-1971, 21 August 1921, SECOND SECTION, Image 9, via chroniclingamerica.loc.gov. 561k S-10 (SS-115) & S-15 (SS-120) in the foreground. Behind them from right to left: O-1 (SS-62), O-4 (SS-65), O-2 (SS-63) & O-3 (SS-64). What appears to be another conning tower is behind the O-3. 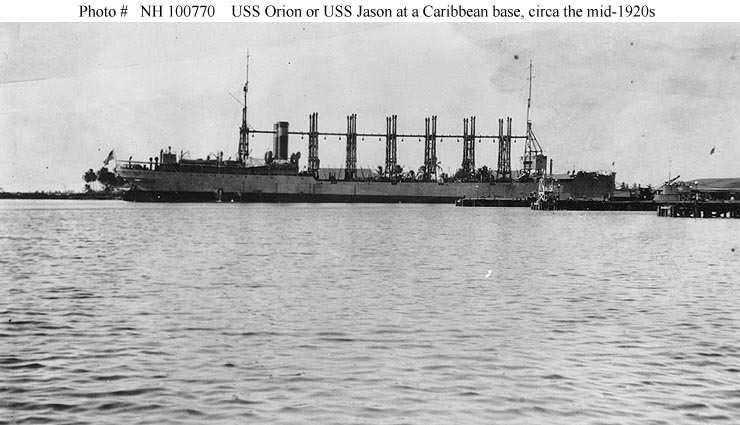 If so, and being that all the O-boats are together numerically, it might be the O-5 (SS-66), which would date the photo no later than 28 October 1923 when the O-5 sank after being rammed while entering Lemon Bay, Canal Zone, 28 October 1923, by United Fruit steamer Abangarez. Photo by Arkivi/Getty Images via Getty Images, courtesy of gettyimages.com. O-2 (SS-63). USN photo # NH 102780, courtesy of USNHC. Courtesy of Chief Boatswain's Mate George Behrens, USN (Retired), 1974. 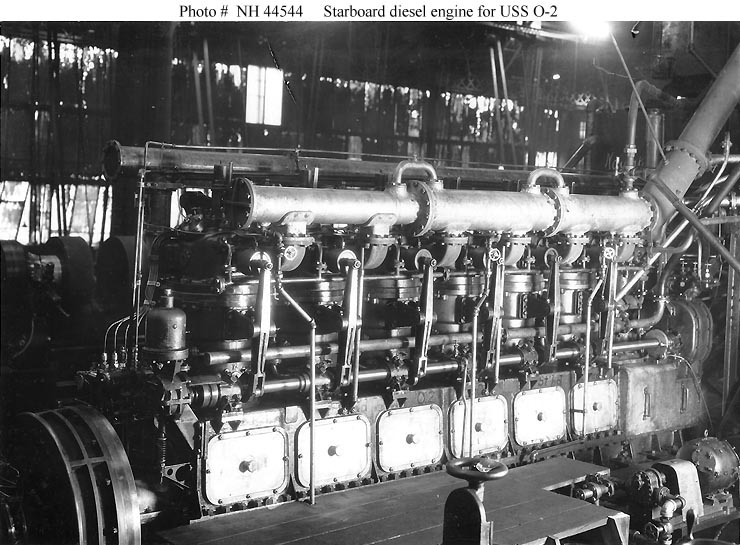 108k Starboard diesel engine, prior to installation in the O-2 (SS-63), circa 1917-1918. This is presumably a 6 cylinder, 440 BHP, New London Ship and Engine Company (NELSECO) 6-EB-14 type engine. USN photo # NH 44544, courtesy of USNHC. 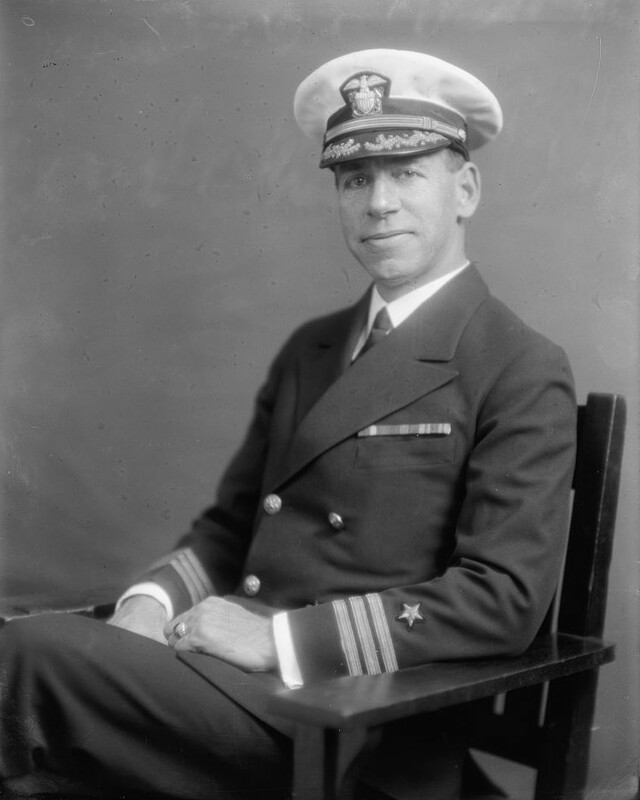 98k Lt. Frederick Carl Sherman served as commanding officer of submarines H-2 (SS-29) and O-2 (SS-63) during World War I. Photo # 19471v courtesy of the Library of Congress via Bill Gonyo. 85k Submarine Division 8,Commander Guy E. Davis commanding. 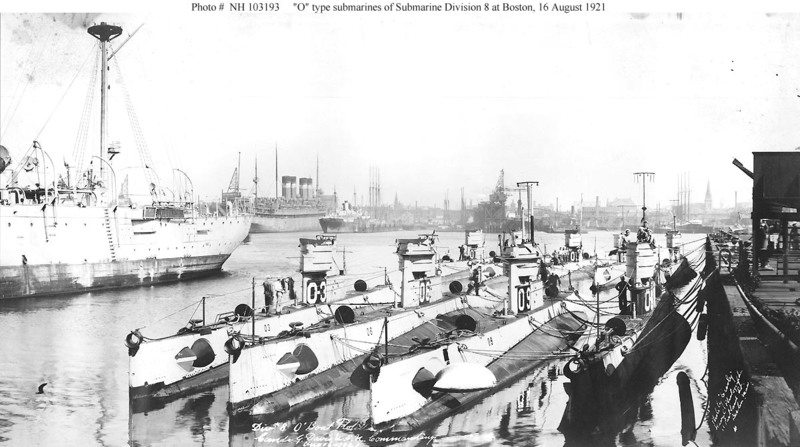 Nine of the Division's ten O-boats at the Boston Navy Yard, Charlestown, Massachusetts, 16 August 1921. Panoramic photograph by Crosby, "Naval Photographer", 11 Portland Street, Boston. 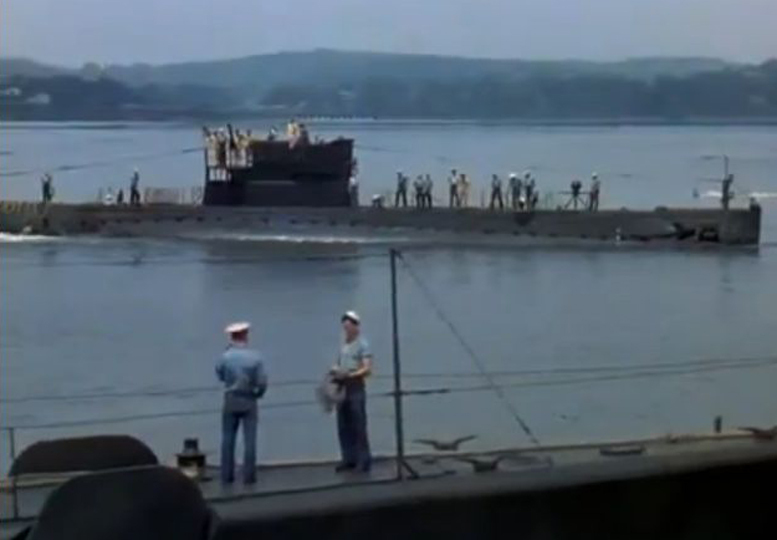 Submarines in the front row are (from left to right): O-3 (SS-64), O-6 (SS-67), O-9 (SS-70) and O-1 (SS-62). Those in the second row are (from left to right): O-7 (SS-68), unidentified (either O-2 or O-8), O-5 (SS-66), O-10 (SS-71) and O-4 (SS-65). Large four-stacked ship in the left center distance is the U.S. Army Transport Mount Vernon. U.S. Naval Historical Center Photograph # NH 103193. 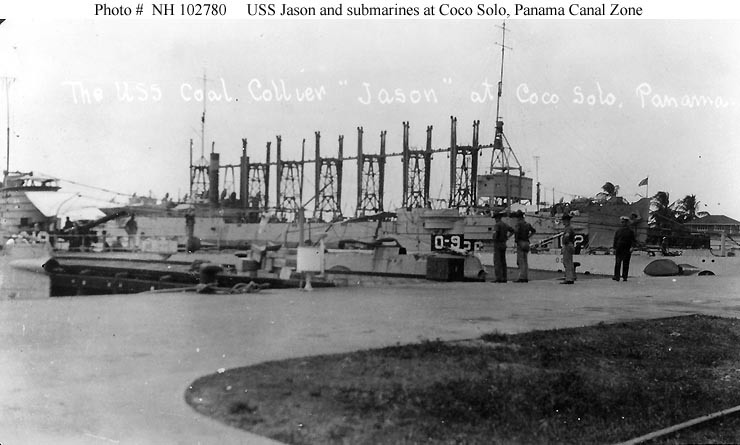 63k Orion (AC-11) or Jason (AC-12) at a Caribbean area base, probably the Coco Solo Submarine Base, Panama Canal Zone, circa the mid-1920s. 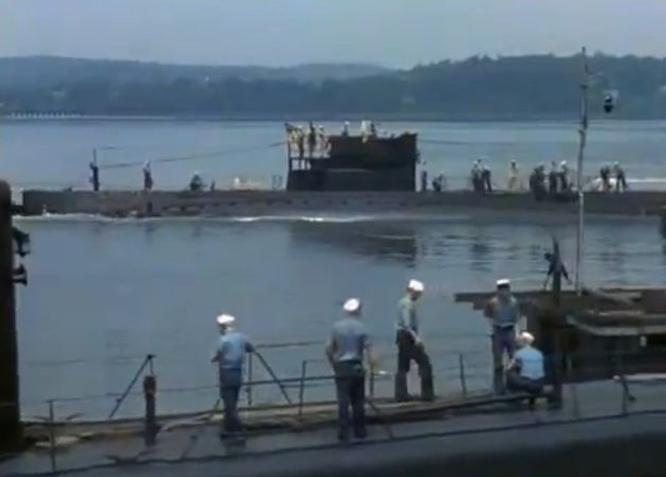 O-2 (SS-63) is at right. USN photo NH 100770 courtesy of USNHC. Courtesy of Paul H. Silverstone, 1986. 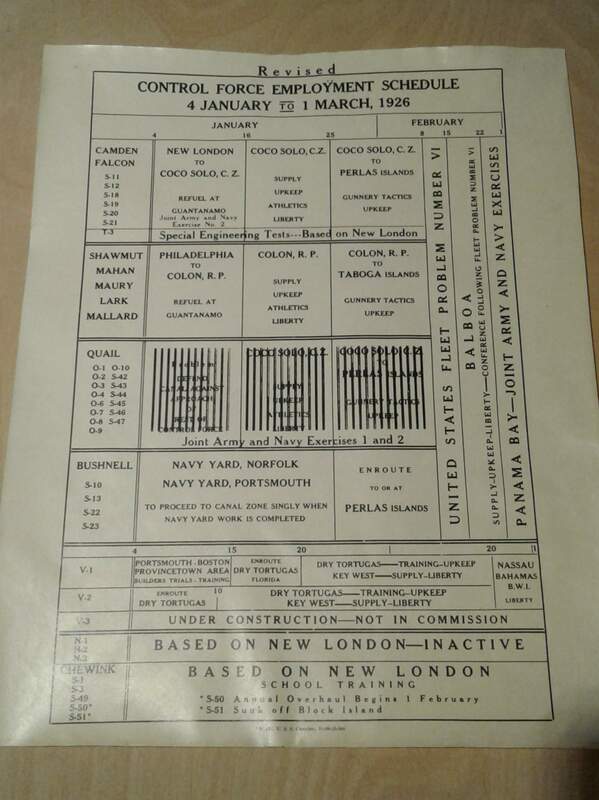 1.72k Control Force Employment Schedule, 4 January to 1 March 1926. US Fleet Problem Number VI. Photo courtesy of Steve Ireland. 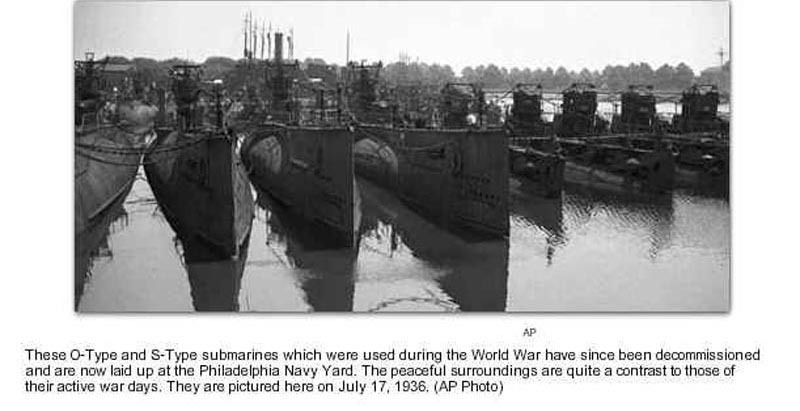 67k These O type and S type submarines which were used during the World War have since been decommissioned and are now laid up in the Phila. Navy Yard. The peaceful surroundings are quite a contrast to those of their active war days. They are pictured here on 17 July 1936. 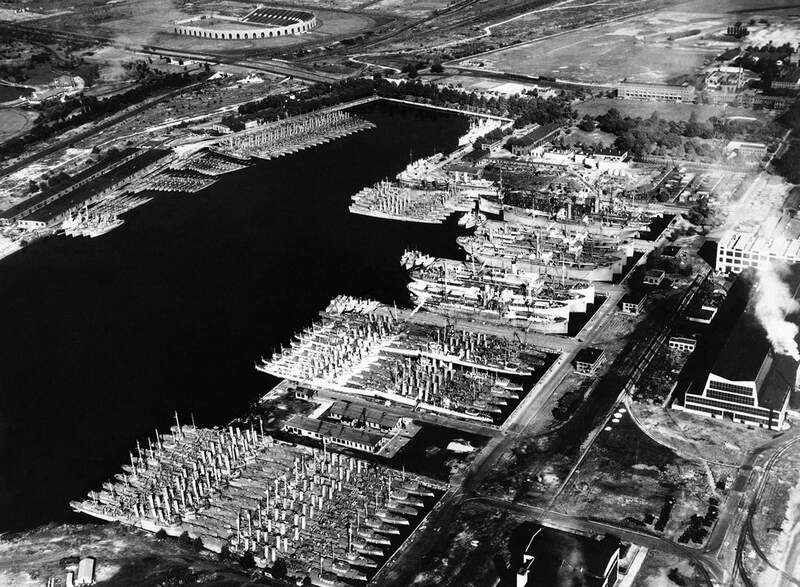 The S-10 (SS-115) was decommissioned on the day this photo was taken at Philadelphia Navy Yard, Philadelphia, PA. and laid up in the Reserve Fleet. Pictured also are any of the following boats that were at the PNY during this time. The O boats: O-1 (SS-62), O-2 (SS-63), O-3 (SS-64), O-6 (SS-67), O-7 (SS-68), O-8 (SS-69), O-9 (SS-70), O-10 (SS-71). The S boats: S-6 (SS-111), S-7 (SS-112),S-8 (SS-113), S-9 (SS-114), S-11 (SS-116), S-12 (SS-117),S-13 (SS-118), S-14 (SS-119), S-15 (SS-120), S-16 (SS-121),S-17 (SS-122) & S-48 (SS-159). Photo & text courtesy of A.P. Wire courtesy of philly.com. 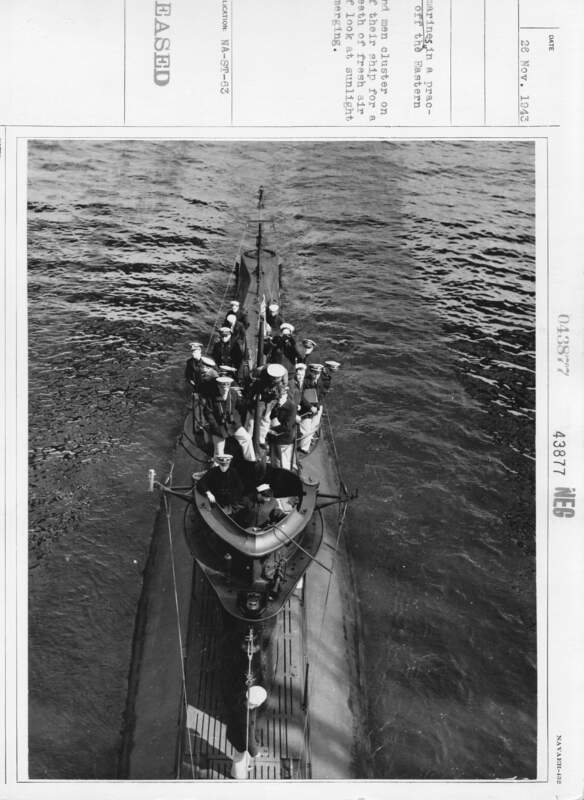 243k O-2 (SS-63), diving, during training operations possibly out of New London, Connecticut, 26 November 1943. USN photo courtesy of Scott Koen & ussnewyork.com. 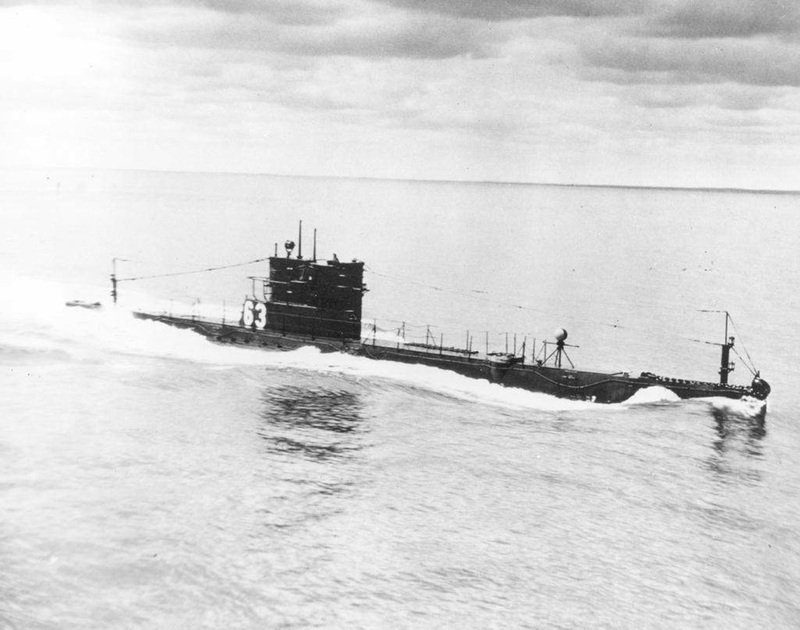 677k O-2 (SS-63), diving, during training operations out of New London, Connecticut, 26 November 1943. USN photo # 80-G-43874 by Cdr. Edward J. Steichen, from National Archives and Records Administration (NARA), College Park, Maryland, courtesy of Sean Hert. 1.10k Officers & men of the O-2 (SS-63) cluster on the deck of their ship for a breath of fresh air after submerging and to look at the sunlight. USN photo # 80-G-43877 by Cdr. Edward J. Steichen, from National Archives and Records Administration (NARA), College Park, Maryland, courtesy of Sean Hert.